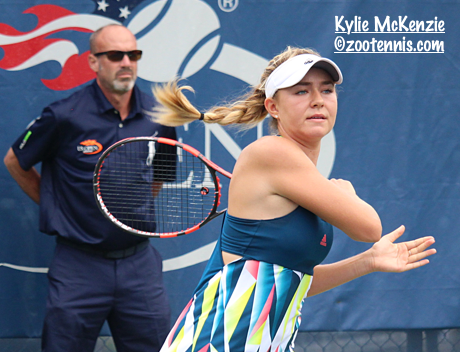 Three American girls and two American boys reached the main draw of the US Open Junior Championships with wins in the final round of qualifying Saturday, with former USTA 16s champions Kylie McKenzie and Patrick Kypson returning after receiving wild cards last year. McKenzie, who received a wild card last year and made the quarterfinals, and received a wild card in 2014 as the San Diego 16s champion, said she requested a wild card again this year. She didn't receive one, but saw the benefits of playing the qualifying given her difficult year. "I'm playing much better now," said the 17-year-old from Arizona, who beat No. 3 seed I-Hsuan Cho of Taiwan 6-0, 6-2 today. "It's been a little bit of a rough year with injuries, trying to come back and get my game back to the aggressive game style. I was really excited to be back here, after last year doing well. Coming here to play qualies, I just saw it as an opportunity to get some matches in before main draw. I did apply for a wild card, but I was totally okay with being in qualies. I actually thought it would be better because I could earn my way into the main draw and it was a chance for me to get extra matches in." 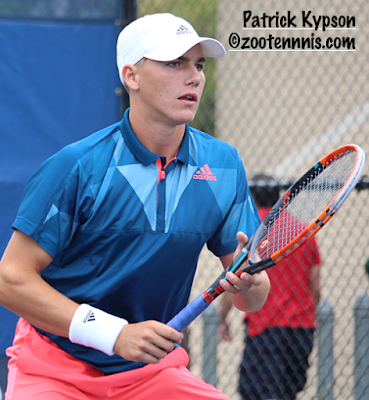 Kypson, who won the Kalamazoo 16s last year and won a round in the main draw with his wild card, had a much tougher match in Saturday's final round of qualifying, beating No. 16 seed Alexander Donski of Bulgaria 6-3, 3-6, 6-3. "He was serving well in the first set," said the 16-year-old from North Carolina. "I think he made maybe 25 percent first serves, so I was able to stay neutral off the serve, which is very good. So when he makes a first serve it's tough to find yourself closer to the baseline; he pushes you back well." In the second set, Kypson had chances to break at 3-3, but Donski held, broke and held to even the match. The third set was on serve until Donski served at 3-4, with a missed volley at 30-40 spelling doom. With Kypson serving for the match, there was little to separate the two, but at 30-all, Donski missed a forehand long, and Kypson closed the match with an ace. "When I threw the ball up, I was like, all I have to do is hit the serve good," said Kypson, who received a wild card into qualifying. "Please, please let me ace him, because if it goes to deuce..."
Like McKenzie, Kypson also sees the benefit of getting through qualifying. "Last year I earned it by winning Kalamazoo, but I think if you don't win Kalamazoo, or don't earn it whatever way that you can, that it's better to play qualies. You play two kids that are very good, get used to the conditions and the balls, the atmosphere. For me, I like to play qualies, so I was happy to play qualies." Alafia Ayeni, who played and qualified for Wimbledon Junior championships this year, reached his second straight slam via qualifying with a 6-3, 3-6, 6-3 win over Tulane recruit Ewan Moore of Great Britain. Ayeni, a 17-year-old Californian, broke to take a 3-1 lead in the final set, and made it stand up, serving out the final game with little drama. The two other US girls who won today will be making their junior slam debuts. Sixteen-year-old Ashley Lahey came back to defeat No. 2 seed Zhima Du of China 3-6, 6-2, 6-0 and 14-year-old Hailey Baptiste also came from behind, beating fellow wild card Dalayna Hewitt 6-7(4), 6-2, 6-3. McKenzie, Lahey and Baptiste join 18 other US girls in the main draw, with six of them seeded: Amanda Anisimova(4), Kayla Day(5), last year's finalist Sonya Kenin(8), Usue Arconada(9), Claire Liu(10), Alexandra Sanford(16). Top seed in the girls draw is Wimbledon champion Anastasia Potapova of Russia, who will play Maria Mateas in the first round on Sunday. Only two American boys are seeded: No. 3 seed Ulises Blanch and No. 10 seed John McNally. Top seed Stefanos Tsitsipas of Greece, who lost in the semifinals of the $25,000 Futures in Calgary Canada today, will play wild card Oliver Crawford, who is coming off an ankle injury that kept him from contending the final in the Grade 1 in College Park. That match is not on Sunday's schedule. Lukas Greif, the Kalamazoo 16s champion, drew No. 2 seed Alex De Minaur of Australia and that match is on Sunday's schedule. Other US juniors on Sunday's schedule are Nathan Ponwith, Vasil Kirkov, Nicole Mossmer, Sam Riffice, Claire Liu, Sebastian Korda, Caroline Dolehide, Brandon Holt, Alexandre Rotsaert, Zeke Clark, Amanda Anisimova, Carson Branstine and Sonya Kenin. The girls draw is here. The boys draw is here. The Grade 1 in Repentigny Canada finished today, with No. 5 seed Iga Swiatek of Poland taking the title when No. 2 seed Olga Danilovic of Serbia retired at 3-6, 2-0. No. 12 seed Alejandro Davidovich Fokina of Spain defeated No. 16 seed Liam Caruana of Italy 7-6(0), 7-6(5) to take the boys title. Sam Riffice and Timothy Sah lost in the boys doubles final to No. 2 seeds Piotr Matuszewski and Kacper Zuk of Poland 6-4, 6-7(1), 10-1. The girls doubles title went to unseeded Malene Helgo of Norway and Elena Rybakina of Russia, who beat the Chinese team of Xiyu Wang and Wushuang Zheng of China, seeded No. 7, 7-6(8), 6-4.